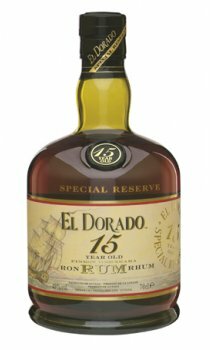 Premier in the range of rums, is the El Dorado 15 years old Special Reserve Rum. Described as an attractive, rich copper hue. A complex nose of confectioner's sugar, banana and cedar. A silky entry leads to a moderately full-bodied palate of vibrant, yet refined dry caramel and grilled tropical fruit flavours braced by warm alcohol, and firm, smooth oak spice. Somewhat scotch like, with subtle peaty overtones. "Beautifully proportioned and designed for long contemplative sipping," Chicago Beverage Tasting Institute. This premium product of great distinction is a blend of specially selected aged rums, some as old as 25 years old, blended to perfection by the company's master blenders and aged in oak casks. To complement this fine product, the rum is packaged in a gold embossed presentation box illustrated with a maritime design, underlying Demerara Distillers' association with ancient maritime traditions. The bottle, a unique custom-designed bottle, was inspired by the shape of the old hand-blown flasks used on the banks of the Demerara river, centuries ago, by the sugar planters. Such pride and care was rewarded in 1998, when the International Wine and Spirit Competition of London voted the El Dorado 15 years old Special Reserve rum, the Best Rum Worldwide, and gave the company, the coveted Wray and Nephew Trophy. Then in 1999, 2000 and 2001, the 15 years old Special Reserve rum was judged Best Rum in the World, won the Wray and Nephew Trophy and is today known as the world's only rum to achieve such a feat. Long acknowledged as the Caribbean's premier rum, continuously winning medals over the past decade at the Caribbean Rum Taste Test held annually in Barbados, the El Dorado 15 years old Special Reserve Rum won in 2001, the Platinum Award and was voted the Connoisseurs' Choice at the Chicago Beverage Tasting Institute. And, in 2002, the International Rum Festival of Canada, awarded this superb rum, the gold medal and first place in the super premium category of rums. The El Dorado 15 years old rum is available across the Caribbean and in excess of 60 countries around the world. Very lovely to drink on the rocks or with coke. Or whatever you fancy. The taste of this is sublime, very rich and warm. It also has an lovely after taste and glow. If anyone mixes this rum they should be hung maritime style. One of if not thee best rums I've ever purchased. so smooth and creamy it has such a mild burn so you can really sample all the flavour it has to offer. If you're looking for more of a kick then try an Appletons or R L Seales. The sweet aftertones are amazing too. If there was ever a reason to start drinking rum this would be it! Velvet smooth, refreshing with heavy notes of vanilla and citrus peel. Perfect for long winter nights in front of the fire, or at a pirate party cos the bottle is old school!! I found this to be one of the finest rum experiences I have ever had. If you never try another rum then this one is not to be missed. A fragrent blend, not too powerful to be unpleasent but blended to leave you wanting more after each sip.I normally mix my rum but found myself not wanting to with this as it smelt so good.